The image above is a chart, set for Greystones in County Wicklow, Ireland at the time of the exact opposition, therefore FULL stage of the Sun-Moon cycle, that happened to be both the Full Moon and a lunar eclipse. If you look at the chart, the image enclosed on the left hand side of the circle within the red oval is that of the Moon. On the It fell at 4 degrees of Fixed Air, or the tropical zodiac sign of Aquarius. On the right hand side of the chart, within the red oval, is the symbol for the Sun, also at 4 degrees, but this time in Fixed Fire, the sign of Leo. When two planets are directly on the opposite side of the zodiac from each other, it is called an opposition and that refers to a state of illumination or indeed confrontation. The degrees of the zodiac are merely abstract markers to enable us to specific locate where along an imaginary band that the planets are oscillating, as seen from the Earth. The fact that the Sun and Moon are close to the horizontal thick red line between the colour ring of the zodiac and the inner circles that have number within it, means that over Ireland, at the precise time that the Full Moon was peaking, the Moon was figuratively about to rise and the Sun was figuratively about to Set. I say figuratively, since a chart does not take into consideration the condition of the local horizon or the issue of latitude. However, for all intents and purposes, we will say that the Moon and Sun archetypes were ‘accentuated’ for the Irish people, since the phenomena of angularity (close to an angle) amplifies the nature of the planet that happens to be close to one of those four angles. If you are seeking to interpret whether the Full Moon has a personal resonance within you, by looking at your chart, as opposed to listening to your body and gut, then you need to check whether you have any planets (or angles or whatever else you use in your chart) at 4 degrees of Aquarius or Leo. If you do, then this Full Moon/ eclipse will emotionally accentuate the themes and patterns of the entire planetary complex that is being illuminated. I say the ENTIRE complex, since the planets in your chart do not ‘work’ in isolation and therefore whilst the agency maybe the planet directly at 4 degrees of Aquarius/ Leo, any planet in aspect to that being opened up will also resonate for you. However, if you are new to astrology, then just focus on the nature of the planet itself that is being confronted/ illuminated and ask yourself whether you ‘feel’ that planetary archetype more/ less acutely over the past 24 hours. If your Sun, for example is at 4 degrees, then it means that you are gaining a deeper emotional insight into the scripts and patterns regarding your sense of ‘doing’ and ‘being’ out in the material world; if it is your Mercury, then you are gaining a sense of emotional awareness of the patterning of your mind, your perception and your way of being heard. If you understand the nature of the planetary archetypes you can apply this same logic of an EMOTIONAL AWARNESS/ CONFRONTATION of the planetary archetype within you that is being brought to the fore of your life during this eclipse/ Full. If you go one step further, ANY planet at 4 degrees of ANY sign, will also be brought to the fore. Do check out those patterns too. You can also look at any planet that is located at 19 degrees of Gemini, Virgo, Sagittarius or Pisces, as those planets too are being brought forward into your emotional awareness during this Full Moon. 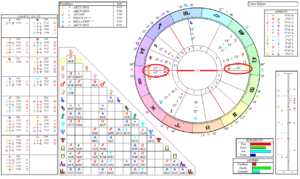 If you prefer to reflect on the spiral and cyclical nature of how themes emerge in your life, the last time we experienced eclipses within the tropical zodiacal signs of Leo / Aquarius was between 1998 to 2000. Perhaps you could take some time to reflect back to those years and see if arising in your awareness are any similar emotional themes. If so, what did you gain from those insights and experiences? Can you feel anything similar rising again within your Field and if so, what can you integrate further and what deeper layers of healing can you now apply so that you can further raise your awareness? Finally, if you are an advanced student or are a Blue Rose student and have been exposed to our unique philosophy on midpoints, you can check out the midpoint structures that are located within a degree of 4 degrees of FIXED SIGNS in your Midpoint Sort to see what healing patterns are being activated during the past 24 hours. I hope this helps you use astrology a little better to gain a personal insight into the nature of this eclipse/ Full Moon.